Statcounter provides customisable hit counters, visitor tracking, web analytics and website stats for DoYourOwnSite. 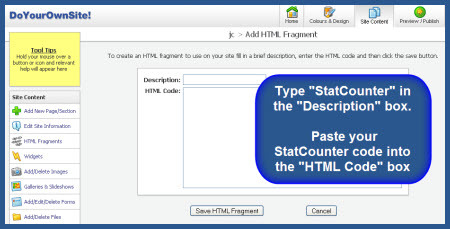 Towards top/middle of page click "Add New HTML Fragment"
Click "Save HTML Fragment" - you have now created your StatCounter HTML Fragment - to track your visitors you now need to add this HTML Fragment to the pages of your site. Now click the "HTML" button in the edit menu. This is a little tricky to find. It’s in the row of buttons just above your site content, beside another button that looks like a flash of lightning. When you click the HTML button a small window opens. Select the StatCounter fragment and click "ok"
Click "Save & Exit" and that’s it! Your StatCounter will now begin recording visitor information and, if you chose the visible option, your counter will be visible on your website! 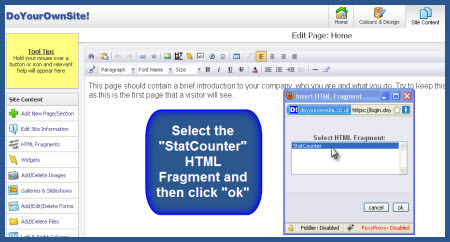 We recommend that you add StatCounter to all pages of your site. To add StatCounter to other pages of your site, click "Edit Page" and follow the steps above for each page of your site. NOTE: You should NOT create additional StatCounter HTML Fragments - just add the same StatCounter HTML Fragment to each page of your site. Sign up for a Statcounter account using our DoYourOwnSite installation guide. You can reinstall DoYourOwnSite on your Statcounter project.